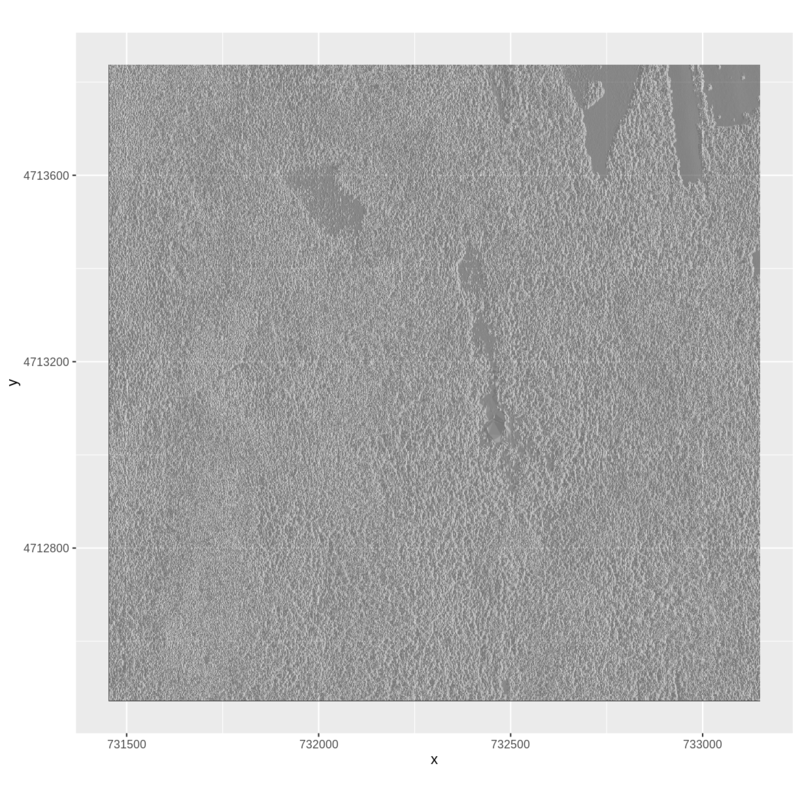 How can I create categorized or customized maps of raster data? How can I customize the color scheme of a raster image? How can I layer raster data in a single image? 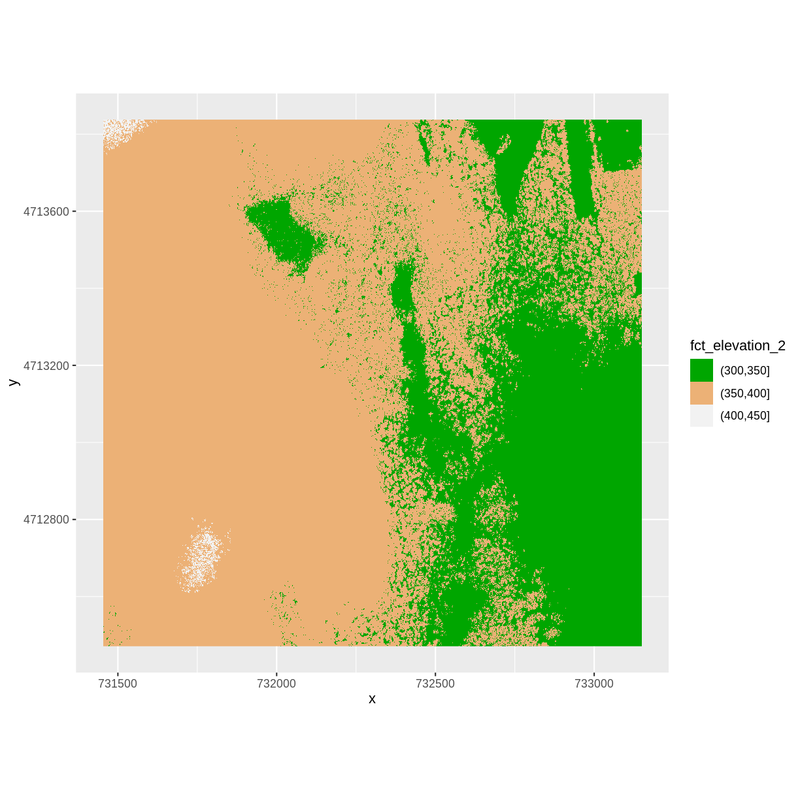 Build customized plots for a single band raster using the ggplot2 package. 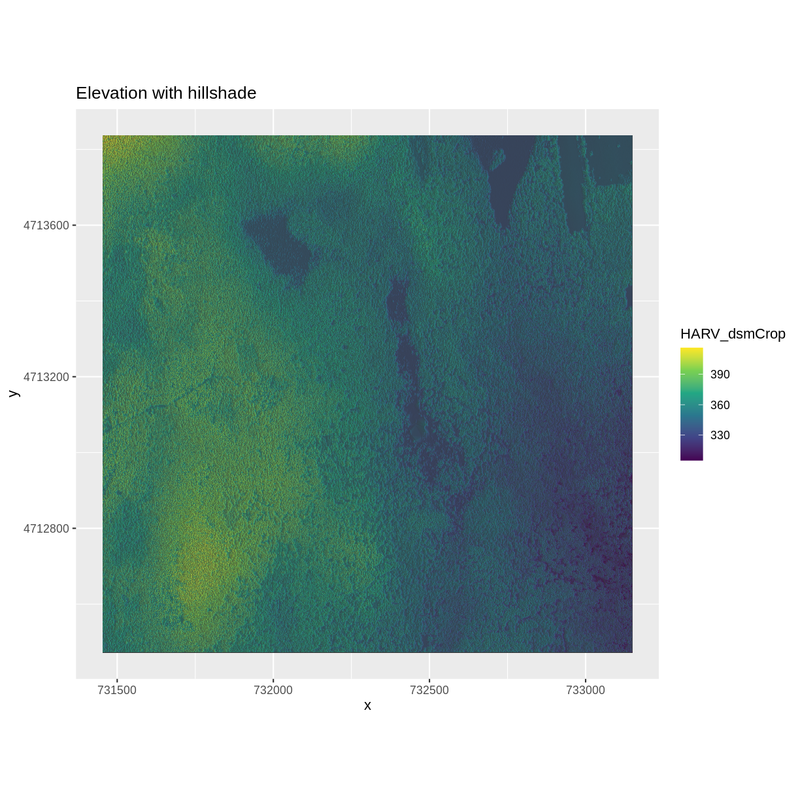 Layer a raster dataset on top of a hillshade to create an elegant basemap. 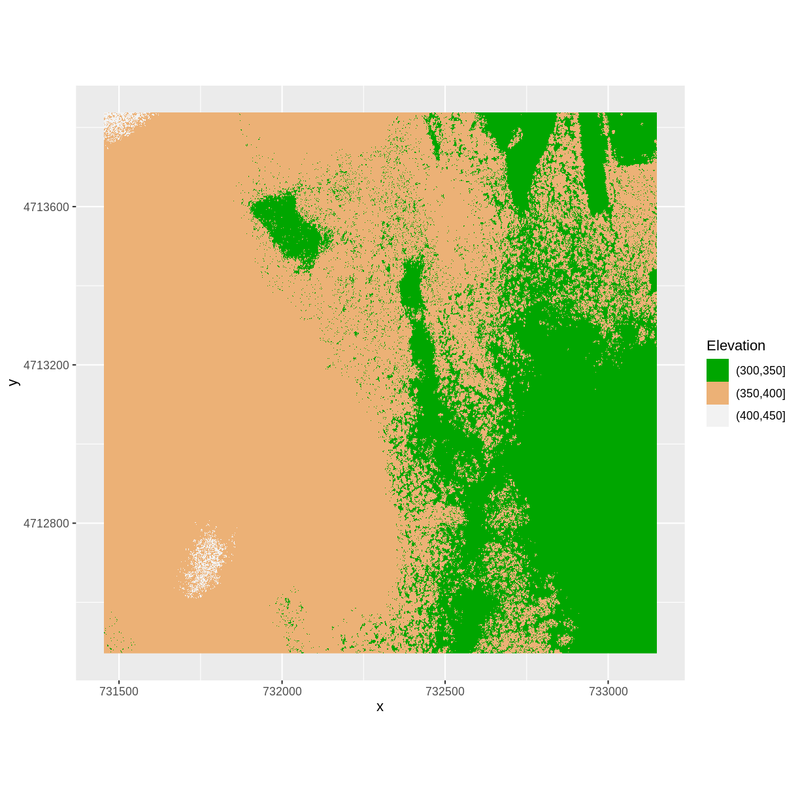 This episode covers how to plot a raster in R using the ggplot2 package with customized coloring schemes. It also covers how to layer a raster on top of a hillshade to produce an eloquent map. 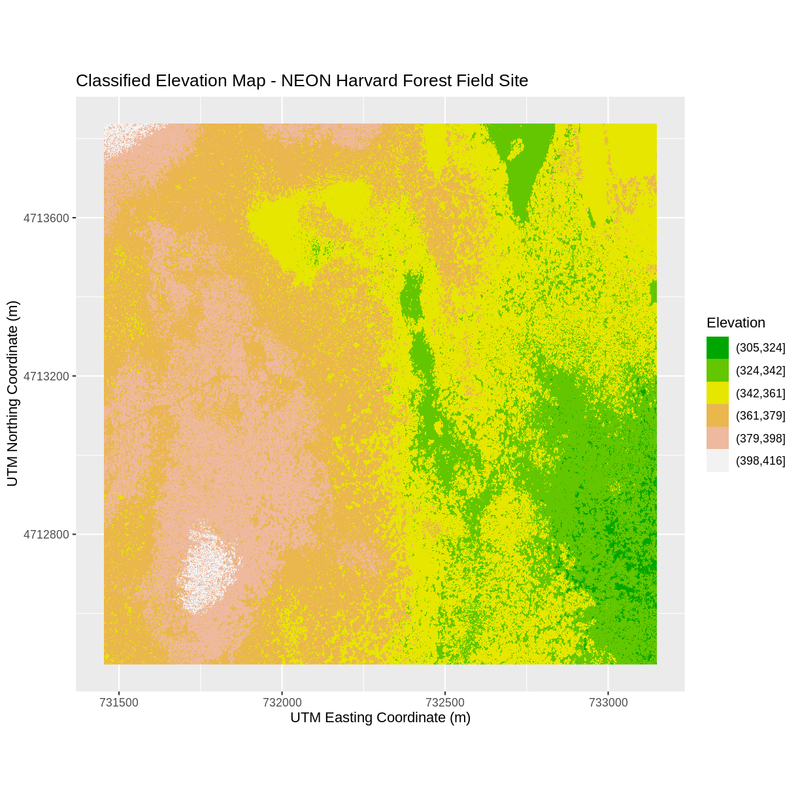 We will continue working with the Digital Surface Model (DSM) raster for the NEON Harvard Forest Field Site. In the previous episode, we viewed our data using a continuous color ramp. For clarity and visibility of the plot, we may prefer to view the data “symbolized” or colored according to ranges of values. This is comparable to a “classified” map. 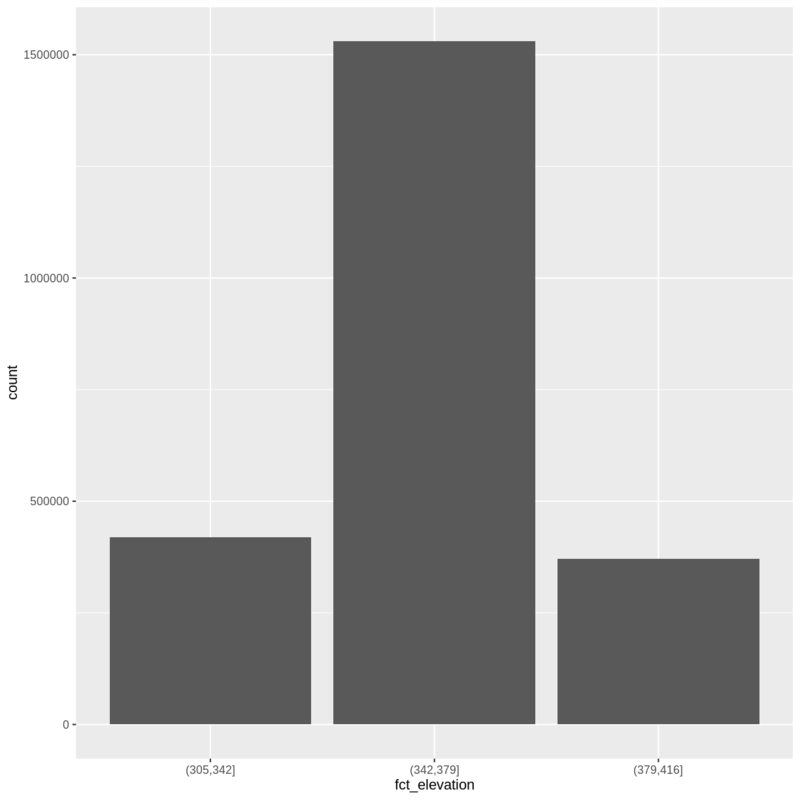 To do this, we need to tell ggplot how many groups to break our data into, and where those breaks should be. To make these decisions, it is useful to first explore the distribution of the data using a bar plot. 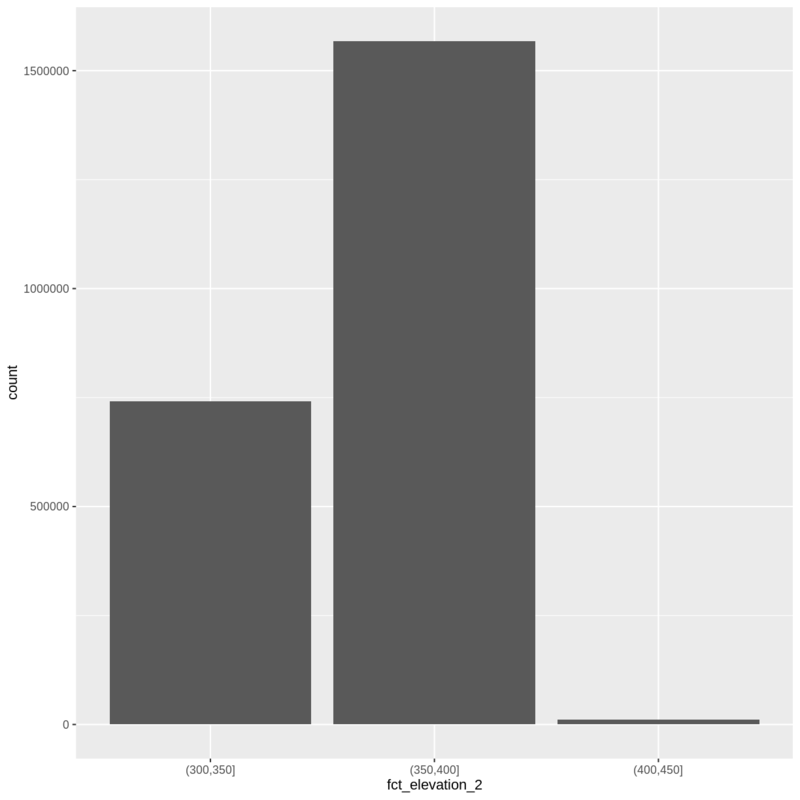 To begin with, we will use dplyr’s mutate() function combined with cut() to split the data into 3 bins. We might prefer to customize the cutoff values for these groups. Lets round the cutoff values so that we have groups for the ranges of 301–350 m, 351–400 m, and 401–450 m. To implement this we will give mutate() a numeric vector of break points instead of the number of breaks we want. Note that when we assign break values a set of 4 values will result in 3 bins of data. The bin intervals are shown using ( to mean exclusive and ] to mean inclusive. For example: (305, 342] means “from 306 through 342”. The terrain.colors() function returns hex colors - each of these character strings represents a color. To use these in our map, we pass them across using the scale_fill_manual() function. If we need to create multiple plots using the same color palette, we can create an R object (my_col) for the set of colors that we want to use. 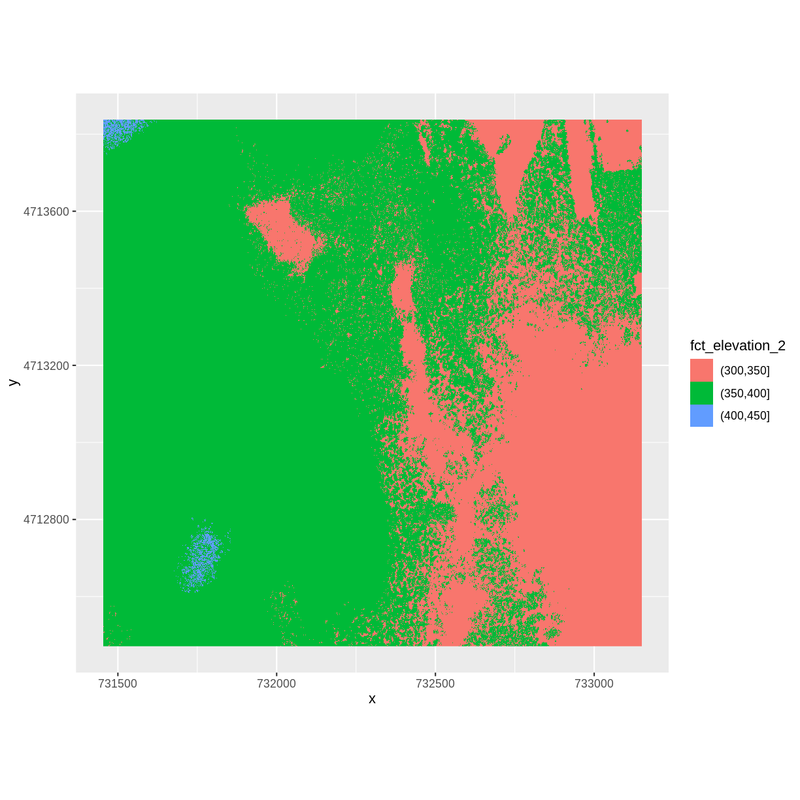 We can then quickly change the palette across all plots by modifying the my_col object, rather than each individual plot. We can label the x- and y-axes of our plot too using xlab and ylab. We can also give the legend a more meaningful title by passing a value to the name argument of the scale_fill_manual() function. Or we can also turn off the labels of both axes by passing element_blank() to the relevant part of the theme() function. Six classified ranges of values (break points) that are evenly divided among the range of pixel values. We can layer a raster on top of a hillshade raster for the same area, and use a transparency factor to create a 3-dimensional shaded effect. 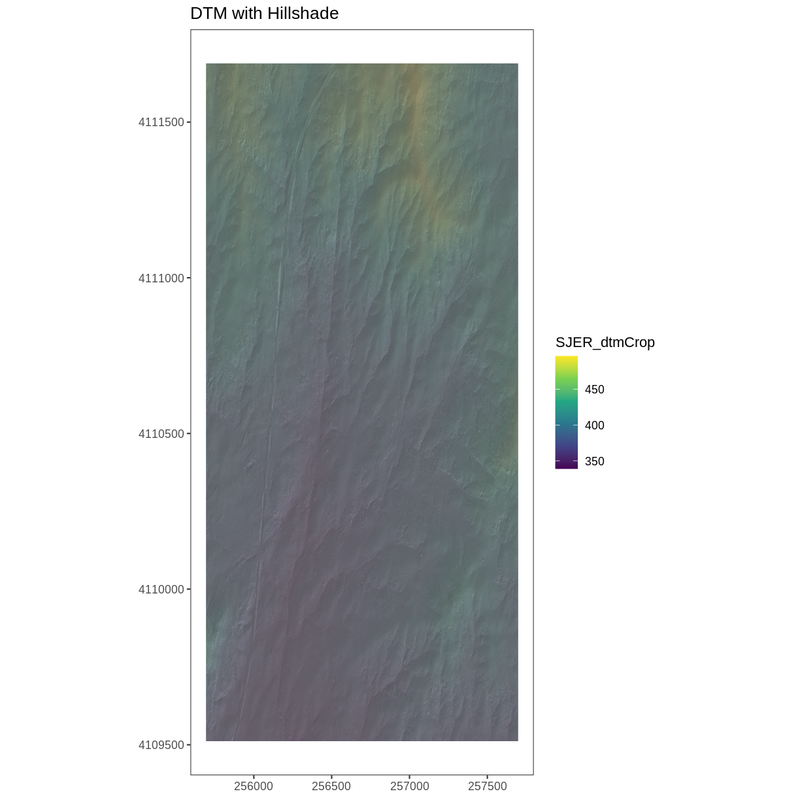 A hillshade is a raster that maps the shadows and texture that you would see from above when viewing terrain. We will add a custom color, making the plot grey. Turn off, or hide, the legend on a plot by adding guide = "none" to a scale_something() function or by setting theme(legend.position = "none"). The alpha value determines how transparent the colors will be (0 being transparent, 1 being opaque). We can layer another raster on top of our hillshade by adding another call to the geom_raster() function. Let’s overlay DSM_HARV on top of the hill_HARV. Use the files in the NEON_RemoteSensing/SJER/ directory to create a Digital Terrain Model map and Digital Surface Model map of the San Joaquin Experimental Range field site. 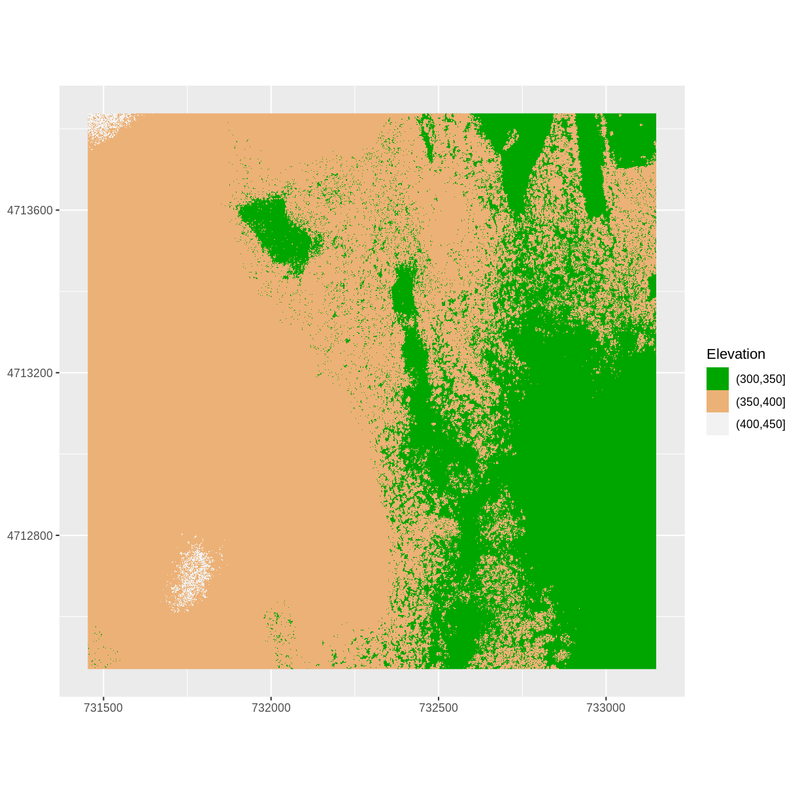 experiment with various alpha values and color palettes to represent the data.